ITEM: editorial, The Daily Journal (Wilmington, N.C.), 16 April 1862, page 2, column 1. CITATION: Editorial, The Daily Journal (Wilmington, N.C.), 16 April 1862, page 2, column 1. North Carolina Collection, Wilson Library, University of North Carolina at Chapel Hill. WILMINGTON, N. C., WEDNESDAY, APRIL 16, 1862. The telegraph brings us a considerable amount of something, whether it is good or bad, reliable or unreliable, our readers must decide for themselves. It appears to be certain that the enemy is about to make his greatest effort on the Southern Peninsula of Virginia. His forces are gathering around Hampton Roads in immense numbers, and his fleets threaten Norfolk and Yorktown, while the peninsula itself, nowhere over fifteen miles wide in its lower part, is at one point only seven miles wide. Washed on one side by the James River, and on another by the York, and rounded off at its lower extremity by Fortress Monroe, which looks into Hampton Roads on the South and West, and the Chesapeake Bay on the North and East, the Peninsula offers to the invaders an opportunity to avail themselves of all their resources and advantages. Their forces no longer swarm on the Potomac, and the Confederates have approached Alexandria without even seeing a foe. When the battle does come off, it will be a fearful one, for the stake is enormous, being nothing less that the fate of Virginia. Having taken months to prepare, having assembled such a force as the world has not seen since Napoleon advanced into Russia, McClellan feels that to him defeat would be ruin, while the confederate soldiers and leaders feel that not only their fate, but the fate of their country, is staked upon the issue, and they cannot afford to be defeated. The contest cannot long be deferred. The news of a terrible battle may startle us at any moment. We trust that our people are prepared, not only to call upon God to defend the right, but, under God, to defend themselves, with brave hearts, strong arms, and sufficient numbers. And charge with all thy chivalry ! For not only the fate of the temporary seat of government, but of Eastern Virginia, and even more than that, trembles in the balance. We presume that President Davis himself will be on the field as he has intimated. He will share the fate of his soldiers in life or in death, in victory or defeat. 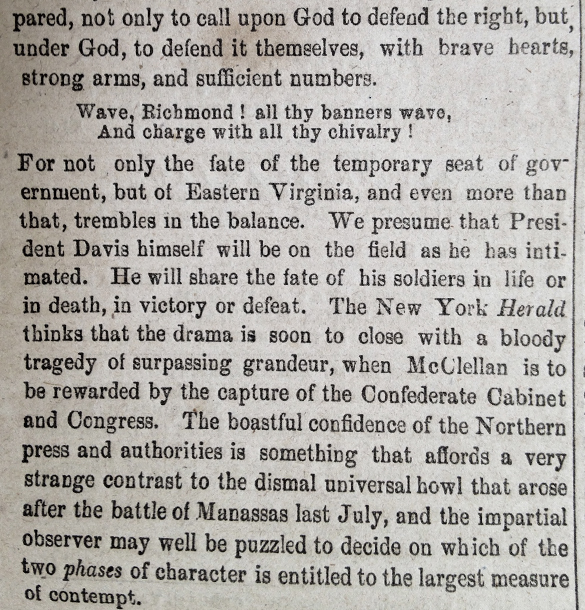 The New York Herald thinks that the drama is soon to close with a bloody tragedy of surpassing grandeur, when McClellan is to be rewarded by the capture of the Confederate Cabinet and Congress. 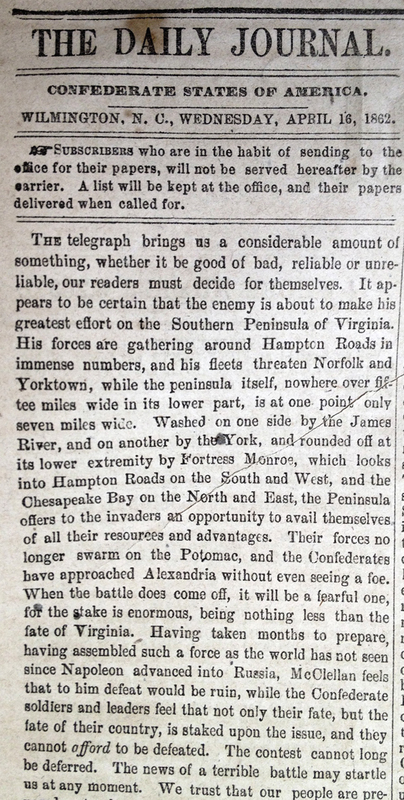 The boastful confidence of the Northern press and authorities is something that affords a very strange contrast to the dismal universal howl that arose after the battle of Manassas last July, and the impartial observer may well be puzzled to decide on which of the two phases of character is entitled to the largest measure of contempt. It will be seen that the Federal papers claim a great victory at Pittsburg, as they call the battle-field of the sixth and seventh instant. They admit a loss of twenty thousand, and assert the Confederate loss at thirty-five to forty thousand. That they admit their own loss to be larger than it is, we cannot suppose, indeed their claiming a victory, shows that they will lie to make a good showing. Of our loss, we have no official report, but it is not over one sixth the amount stated by them. They will be certain to pour down all their hosts to endeavor to change their defeat into final victory. Reinforcements are pressed forward and General Halleck, their commander-in-chief west of the mountains, has gone to the scene of action. 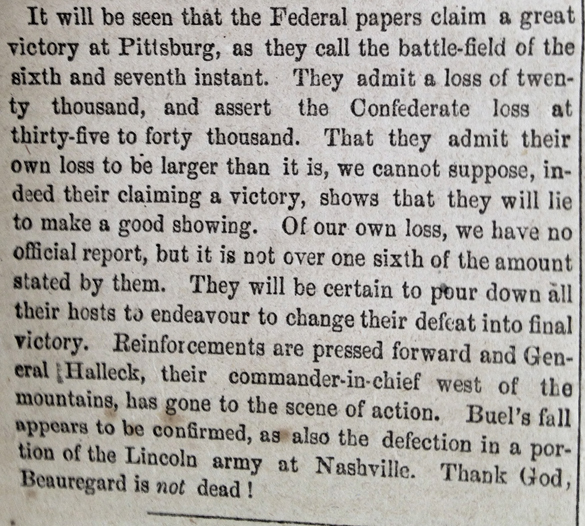 Buel’s fall appears to be confirmed, as also the defection in a portion of the Lincoln army at Nashville. Thank God, Beauregard is not dead ! This entry was posted in North Carolina Collection and tagged Battle of Pittsburg Landing, Battle of Shiloh, defection, Gen. George McClellan, Hampton Roads, newspapers, The New York Herald, Virginia, Wilmington (N.C.) Daily Journal. Bookmark the permalink.